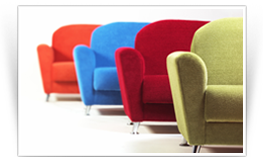 Demanche Upholstery offers unrivaled experience, excellent customer service, and competitive pricing. When the furniture in your home or office needs a new look, Demanche Upholstery can help. Owner Michael Demanche has 45 years of experience in the upholstery business, and has earned a reputation for high-quality work and excellent customer service, at a competitive price. Whether you are a homeowner looking to update chairs, benches, or sofas, or a business owner seeking to reupholster an entire restaurant, bar, or office, Demanche Upholstery near Manchester, NH has the experience and skills to get the job done professionally and efficiently. Demanche Upholstery’s owner, Michael Demanche, has worked in the upholstery business for 45 years. Michael is a master upholsterer who began learning the trade as a teenager. After serving in the armed forces in the Vietnam era, he worked as an apprentice at a major upholstery company, where he learned his craft. Since 1980, Michael has been self-employed, providing a full range of upholstery services for residential and commercial customers. Demanche Upholstery serves Merrimack, the Greater Nashua Area, and the Greater Manchester Area in New Hampshire. © Demanche Upholstery. All Rights Reserved.